Amazon plans to introduce a new, larger version of its e-book reader Kindle as early as this Wednesday according to reports. The new device will be aimed as an alternative to physical newspapers and magazines in a bid to salvage the dying print media. The New York Times reports that Amazon is the first in line to try and revive the old-media companies by launching a large-screen Kindle especially designed to display newspapers, magazines and textbooks as well. It's not often the NYT gets involved into rumors, but the paper says the giant Kindle could be launched this week. Interestingly enough, NYT seems to have gotten this rumor from its own people, as the report claims news organizations, including the New York Times, are involved into the introduction of the big and shiny Kindle. As usual, Amazon or the NYT itself did not comment on this matter (which makes it even more exciting). A concurrent report from the Wall Street Journal claims that some newspaper and magazine companies are pushing for alternatives to the Kindle. The publishers say they are feeling let down by the controlled subscription pricing plans Amazon practices and the device's small screen, not fit for advertising purposes. 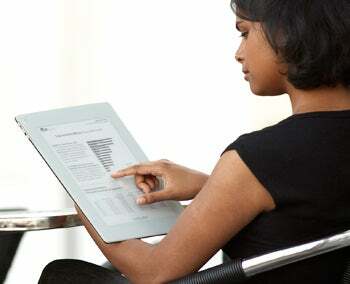 Among the companies to team with print publishers is Plastic Logic, which is developing a reading letter-sized tablet (pictured above). Designed to include advertisements as well, Plastic Logic's device is expected to launch only early next year. Larger-screen reading tablets seem now to be backed by effort of print publishers to revive their trade, badly affected by the economic slump and decline in advertising revenue. Analysis shows that it would actually be twice as cheap for a paper like the New York Times to send each of its subscribers an Amazon Kindle instead of a printed version. But the question remains whether you would pay extra for an e-reader and a subscription to read your daily news, or whether you are satisfied with your dose on online news via your computer and mobile device already. Please let me know you thoughts in the comments.